"Unfortunately, our work is not supporting this theory," a disappointed expert says. Mostafa Waziri, secretary general of the Supreme Council of Antiquities, said an Italian team conducted extensive studies with ground-penetrating radar that showed that the tomb didn't include any hidden manmade blocking walls, as had been earlier suspected. Francesco Porcelli of Polytechnic University of Turin presented the findings at an international conference in Cairo. "Our work shows in a conclusive manner that there are no hidden chambers, no corridors adjacent to Tutankhamun's tomb," Porcelli said. "As you know, there was a theory that argued the possible existence of these chambers, but unfortunately our work is not supporting this theory." In 2015, the British Egyptologist Nicholas Reeves proposed, after analysis of high-definition laser scans, that Queen Nefertiti's tomb could be concealed behind wall paintings in the famed boy king's burial chamber. The discovery ignited massive interest, with officials first rushing to support the theory but then later distancing themselves and ultimately rejecting it. The ministry said two previous scans by Japanese and United States scientists proved inconclusive, but it insisted that the latest ground-penetrating radar data closed the lid on the tomb's having such hidden secrets. 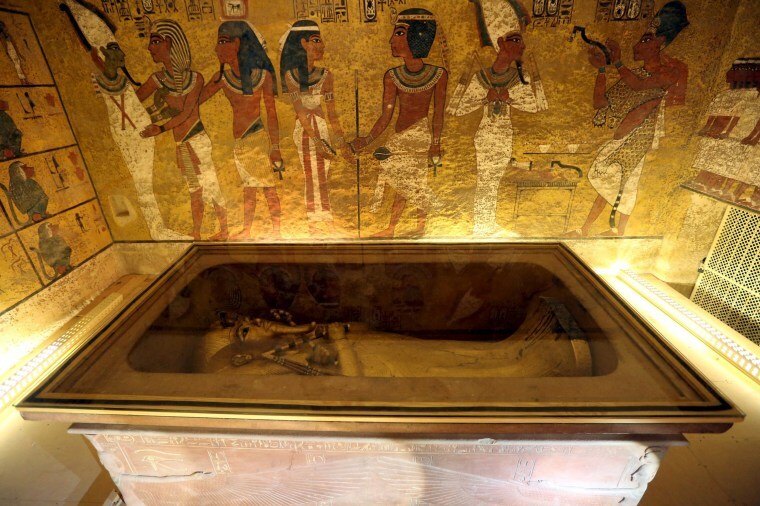 "It is concluded, with a very high degree of confidence," Porcelli said, "the hypothesis concerning the existence of hidden chambers or corridors adjacent to Tutankhamun's tomb is not supported by the GPR data." The ministry has gradually been moving King Tut's belongings to a new museum outside Cairo near the Giza Pyramids to undergo restoration before they are put on display. The transfer of the priceless belongings has become a particularly sensitive issue; in 2014, the beard attached to the ancient Egyptian monarch's golden mask was accidentally knocked off and hastily reattached with an epoxy glue compound, sparking uproar among archaeologists. The fourth International Tutankhamun Conference in Cairo, where Porcelli presented the findings, the most extensive radar survey of the site to date, was attended by a wide range of Egyptologists and archaeologists from the world over. During the conference, Antiquities Minister Khaled al-Anani said that the first phase of the new museum, including King Tut's halls, would be completed by the end of this year but that the date for the museum's "soft opening" had yet to be decided. The museum is host to more than 43,200 artifacts, of which more than 4,500 belong to King Tut alone, and its grand opening is planned for 2022.